Usually I’m behind the curve on trends or fads. I guess I avoid them so as not to be too “trendy”, and then after awhile realize that it’s something I’m actually interested in. But by the time I climb on the bandwagon, the rest of the passengers are already exiting at the rear. Not this time. I can see the trend forming right now and I’m right on top of it. I am officially declaring 2008 as the Year of the Beard. We will start seeing more and more celebrities (I’m talking about the George Clooney types) sporting beards this year. Neatly trimmed beards will make some appearances at the Academy Awards, the Golden Globes, People’s Choice, and MTV VMAs . When all or most of these come true during the course of this year, remember where you heard it- and that I was the first on board this time. Holy crap! It’s already starting! 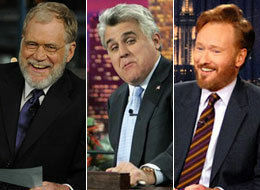 Check out the late night hosts below. Ignore Leno for a second (He probably would have a hard time holding up a beard with that enormous chin anyway) and check out Dave and Conan. They are sporting some serious beardage. Looks like even the rich folks don’t shave when they’re off work.